After a power source for the community of Krypton survivors is accidentally whisked to earth, Kara-El (Helen Slater), cousin to Superman and niece to Jor-El, chooses to go to earth to find it, and bring it back. Upon her arrival, she becomes just a powerful and Super as her cousin, but encounters dangerous battles and unexpected obstacles when a mean spirited woman who practices rituals of the occult takes the power source for herself, and uses it to cause destruction and attempt zenith human status. 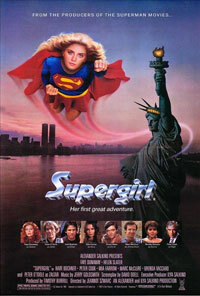 otsoNY Comments: Although the skyline of New York City appears on the Supergirl movie poster, the entire film was shot in England.